Good luck with those of you who are doing last minute Christmas shopping (myself included)! [Repost] Last weekend was one of those weekends where I was super productive and tackled a bunch of little projects on my never-ending to-do list around the apartment. I re-organized the kitchen cabinets, donated bags of things we never use but were taking up precious space and finally finished our entry photo wall! I painted this wall about a year ago and hung a few frames but it never looked right to me. For months I've been staring at this wall, chomping at the bit to really do it right. 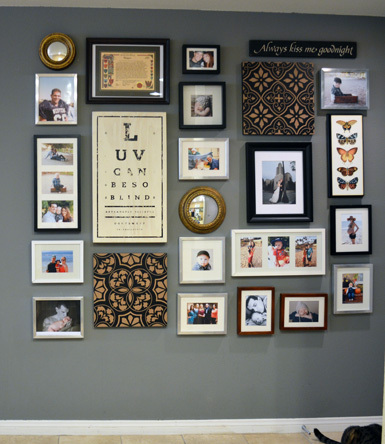 Here are a few notes on how I created this photo wall. I plan on switching out the photos every 6 months to keep things fresh and interesting. Let me know what you think! 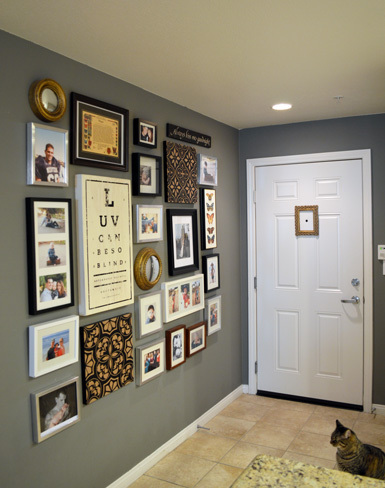 Do you have any plans for updating your entryway this year? 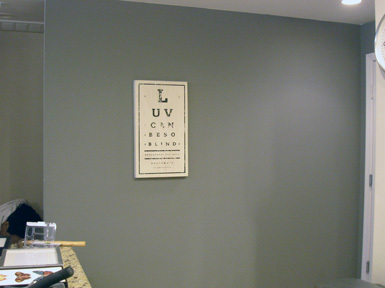 I painted the main entry wall this amazing shade of gray from Benjamin Moore (which I can't find the name of at the moment but will update this post as soon as I do!) I didn't really have a layout in mind on how to hang each piece, but I started with this larger piece first and worked around it. I had all of the frames laid out on the floor and hung them sort of like pieces of a puzzle as I went along - holding up different sizes to see what worked before mounting them with a nail and picture frame wire (although there are quite a few extra holes in this wall with my "eyeball" method!). 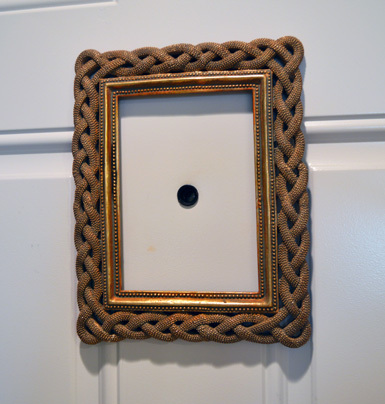 I wanted to mix it up and have more than just frames, so I incorporated a few pieces of art (from Homegoods) and small round gold mirrors, which breaks up all of the photos. 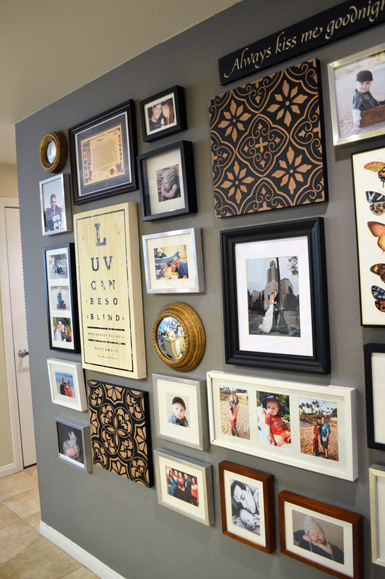 Most of the frames are from Ikea and are in all different finishes, which gives the wall an eclectic feel. 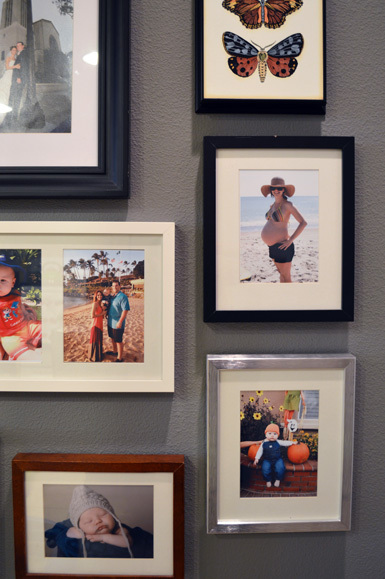 Tip: don't fill the frames until after you've hung the entire wall so you have more flexibility on the direction to hang the frame (horizontal or vertical). It's extra work but worth it! A shot of our front door - as you can see, our entryway is very small and the kitchen is just to the right. Even though it's just an apartment, I really wanted to make our entry dramatic and fun. I hung the frames high on the wall to give the illusion of higher ceilings. Details of frames in all different finishes, which works well. I know it's very "Friends" from the 90's, but the glass broke in this gold frame so I decided to make use of it by mounting it to the door (I used these awesome Hanging Strips from the Command). Now that the wall is complete, I'm realizing that we need a floor runner in a fun pattern, maybe with some color, to complete the look. I'll add that to the list! Oh no!!! I would think a runner in Black and grey so as to not take away from the impact of the wall!!! !